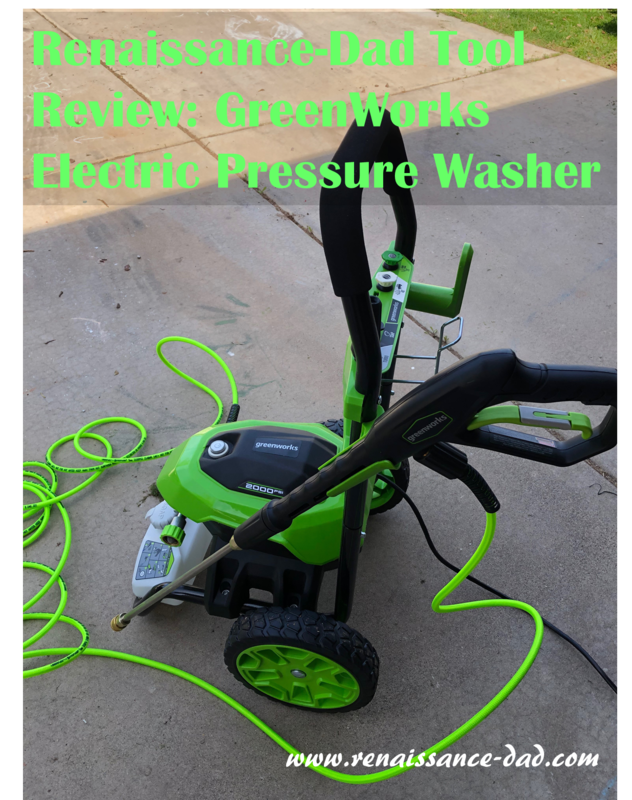 Prior to my experience with GreenWorks electric pressure washers, I had only used gas powered pressure washers. Aside from the exhaust fumes that ruin what should be a cathartic experience, the constant noise of the engine, along with the heat, always made pressure washing an unpleasurable experience. With the GreenWorks electric motor, the unit is practically silent when it is running, but when there is no water coming out of the machine the motor shuts down and it is truly silent. No more ringing in the ears. No more ear plugs. No more nausea from gas fumes. The GreenWorks pressure washer has four nozzles: turbo (general cleaning), soap (low pressure combined with onboard soap container), 40° nozzle (wide fan, great for cleaning your car, patio, or driveway), and 25° nozzle (narrow fan, great for fences, yard borders, or smaller applications). The onboard tool holder has color coded labels, so when they all end up in my pocket after a job I can easily get them back in place. The washer also comes with a 25-foot kink resistant hose, which is a huge upgrade from the previous version (kinks were often a problem). The 35-foot power cord is long enough to get it just about anywhere in my yard (60-foot range with the power cord and hose, without the aid of an extension cord). The first project I wanted to tackle was the driveway. But while I was setting up for that, I decided that my truck wheels needed a good cleaning, so I started there. Using the wide fan and starting further away, I quickly blasted off the tar, oil, and grease that a recent car wash did not remove. Now that my wheels were shiny and my ADD was satisfied, I moved over to the driveway. Our driveway was covered in chalk drawings, tire marks, and grass stains from the mower (huge problem in AZ - winter grass, while very nice in so many ways, leaves heavy residue on the mower wheels, which in turn leaves green stains on the driveway). I started at the top with the wide fan and methodically moved from side to side, top to bottom. I had no idea how dirty our driveway actually was until I cleaned it. Aside from the visible stains, our entire driveway had a grimy coating on it that the pressure washer removed (see "embedded dirt" picture). After the driveway project was finished, the next task was my grill. I typically clean my grill once per year. Actually, a more accurate statement is that one year I cleaned my grill. So I decided that while the pressure washer was out I would tackle that chore. I pulled out the grates and the heat plates, which were all completely coated in grease, charred remnants of delicious barbecues, and drippings of meals long forgotten. I set them, one at a time, against my block wall on a stone border, and gave them a good blasting. So much crud dropped on the stone border that I thought about stopping. Then I realized that I could just pressure wash the shrapnel after I was done, so I proceeded to finish the job. Once everything was clean, I put the pieces back together and ran the grill for 10 minutes to dry everything off. It was so much easier than scrubbing it by hand that I might even clean it again someday. I finished that day by pressure washing my back patio. We have stamped concrete in light blue (note: if you're ever doing a patio, please note that a light color will show every speck of dirt that lands on your patio), and dirt and stains from our recent rain storms were taking their toll. Putting the turbo nozzle back on the pressure washer, I was able to quickly shine our patio, restoring it to its powder blue glory. 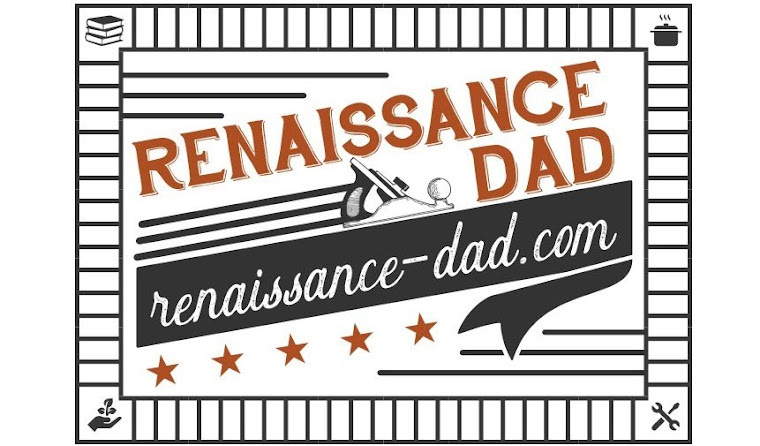 The next weekend I decided it was time for a car wash, and being a Renaissance Dad, I roped my kids into it with promises that they could shoot my truck with a soap gun. The soap nozzle is a fantastic attachment to use for washing cars. The soap dispenser will only work with the soap nozzle (low pressure), and the coverage is fantastic. Because it is low pressure the kids can go nuts, soaping up the car without fear of spraying paint or trim off. I was initially confused because I didn't know how I would get my car clean when there was still soap in the container. However, when you simply switch from the low-pressure nozzle to one of the high pressure ones, the GreenWorks pressure washer automatically bypasses the tank and sprays only clean water. So rinsing those suds away was no problem. The wide fan nozzle (with a picture of a car in case you have parent amnesia) is great for rinsing, and after drying the car off it looked just as good as if I had run it through a car wash.
All in all, this is a fantastic unit for any home owner. It is priced right around $200, which is cheaper than a gas model, and on par or slightly less for comparable electric models. It is so easy to use that you will find yourself searching for new things to pressure wash (block wall? Done! Kids' playhouse? Spotless! Siding? Immaculate! Fruit tree leaves? Okay, maybe not that). I have been so happy with this unit in all of its applications so far. The power has been sufficient for everything that I've thrown at it. And while the performance is about the same as my previous GreenWorks unit, the upgrades and modifications (better onboard storage for nozzles, anti-kink hose, hose hanger instead of hose reel) are a big improvement. I am now anxiously awaiting the next dust storm so I have an excuse to spray off the patio again. - Hose and power cord hangers don't securely keep them in place (two velcro straps solved this problem for me). - Neighbors, family, and friends will want to constantly borrow your pressure washer, so you either need to be generous or keep quiet about owning one.